Margaret Loy Pula's winning entry, Anatye (Bush Potato), selected from 250 entries and 49 finalists. 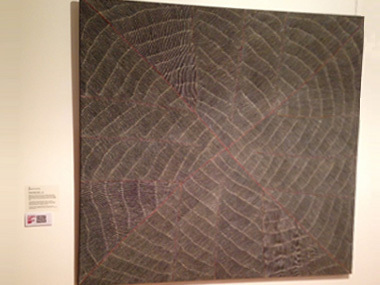 Margaret Loy Pula wins another - this time with the 2014 Redland Art Award for her artwork, Anatye (Bush Potato), selected from 250 entries and 49 finalists. Margaret Loy Pula is the daughter of Kathleen Petyarre and niece of Wynne Prize winner, Gloria Petyarre. “This painting is about my culture. That’s my father’s dreaming. This is from my father’s country, that country is called “Unjangola”. That is north of Utopia, not too far but really desert country,” Margaret said. The Redland Art Awards 2014, a national biennial contemporary painting competition open to all Australian artists and running since 1981, features four prizes: the top award is $15,000, and runner up awards of $4,000 and a $2,500 Local Environment Award, as well as a Meredith Foxton People’s Choice Awards of $500. The judges this year were Maud Page (Deputy Director, Collection and Exhibition, Queensland Art Gallery ¦ Gallery of Modern Art), Joe Furlonger (Award-winning Australian artist and former recipient of Moet & Chandon Fellowship) and Stephanie Lindquist (Director, Redland Art Gallery). Margaret had her first exhibition in 2010. You can find her works at Muk Muk Fine Art.